Jonathan Newell talks to National Instruments about 5G developments and how these will affect a new technology boom. It was a year ago since I last spoke to experts at National Instruments (NI) about developments in 5G technology and, as the company forecast at that time, a lot has changed in the intervening period. I spoke again to NI’s Product Marketing Manager, Sarah Yost, and the company’s Director of RF and Wireless Test, Jason White, about what’s happened and what the company’s announcing at Mobile World Congress (MWC) 2018. One of the most significant developments in 5G during the last 12 months was the 3GPP ratification of Part 1 of the “New Radio” (5G) standard in December 2017. The significance of this is that it creates a set of specifications and therefore a structure against which companies have something to develop and build against. However, as Yost explained, this is only Part 1 and there’s still a long way to go before full implementation. “To meet the original KPIs that were laid out for 5G, the standard is being rolled out in two phases and the December release was part 1 of the first phase,” she explains. Part 2 is expected to be released in June this year and will complete the roll out of Phase 1 of the standard, which addresses data throughput, one of the three KPIs calling for a tenfold increase in speed. The other KPIs address latency and connectivity with ambitions to achieve latencies of less than 1ms and more than 1000 times increase in users. This is phase 2 and will cater for the expected explosion in new applications in transport and the Internet of Things (IoT). NI is expecting rapid development in applications for 5G during the next 12 months and MWC 2019 will be packed with innovation based on this enabling technology. Despite the fact that Phase 2 won’t be expected for another year beyond that, the shackles are off and the mechanism for testing and prototyping is in place. NI has already been working with Samsung in early prototyping and device interoperability testing using the NI SDR (Software Defined Radio), which models different types of devices rather than brands. For example, the SDR can emulate a handset or a device on the Industrial IoT and test it for interoperability with a Samsung base station using mmWave frequencies. 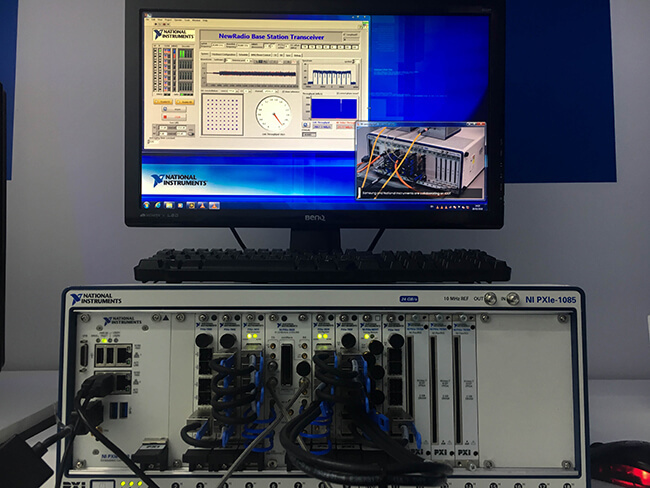 The SDR is a very flexible hardware platform and is driven by NI LabVIEW software giving the ability to test across the whole signal chain and giving test capabilities to silicon providers as well as end user equipment. White expects a lot of trials and collaborative projects to be commenced in the coming year with the first emergence of handsets below the 6GHz frequency. White went on to explain that the technology and initial specification is already there and being exploited. “At MWC 2018, we’re showing the 5G sub 6GHz test reference system, which is being targeted at semiconductor testing,” he says. NI is well positioned to help companies looking to exploit the potential of 5G throughout the supply chain, having been engaged with the technology right from the very start. “We were involved in the initial 5G research 6 years ago and we’ve evolved with the technology so we’re very much a part of it,” White continues. Beyond 2020, the release of the phase 2 standard will provide the technology to drive big changes in the Internet of Things, Virtual Reality and V2X (Vehicle to Vehicle / Infrastructure) communications. IoT applications will benefit from the 1000x increase in connection capabilities, whilst the route to VR and V2X will be smoother thanks to the sub-millisecond latency. A year ago, we discussed the generation gap, where I expressed concern that the 5th generation may not be around in time for its demand based on the rapid increase in connected devices. I asked Yost if this gap had been addressed. “The IoT exists today, it won’t wait for technology to catch up and it doesn’t need to. What 5G will do is enable its further development and have additional functionality with richer features. VR over the IoT will be one such feature,” she explains.